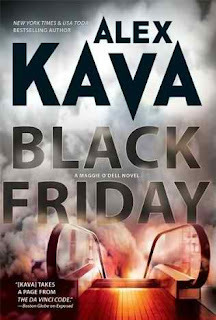 Black Friday is one of Kava's more intriguing novels specifically because it explores one of our country's more recent conspiracy theories regarding the identity of a mysterious accomplice to Timothy McVeigh in the Oklahoma City bombing. Alex Kava has a knack for writing fast-moving, highly suspenseful novels in a style not unlike Jeffery Deaver . Kava has nicely mastered the technique of incorporating red herrings and plot twists into her more recent novels which is a stellar bonus for lovers of mystery! Kava's novels are straight to the point, incredibly action-packed and are truly the perfect escape into continuous entertainment. Black Friday also introduces Maggie's younger brother to readers, ultimately allowing us a closer glimpse into Maggie's personal life -- and love life -- considering love-interest Nick Morrelli is once again coincidentally by her side. The ongoing character development offers a sure treat for fans of the Maggie O'Dell series. Alex Kava is definitely one of those authors whose work I can't miss; I've read every novel by Kava to date, and not one has disappointed! Alex Kava's stand-alone novels include One False Move (2004) and Whitewash (2007). The first Maggie O'Dell novel is A Perfect Evil (2000).